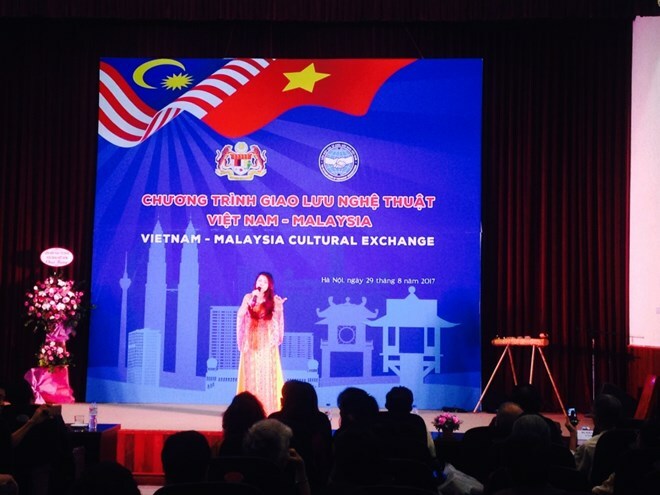 Hanoi (VNA) – An art performance exchange between Vietnam and Malaysia was held on August 29 in Hanoi to celebrate the 60th anniversary of Malaysia’s National Day (August 31) and the 72nd anniversary of Vietnam’s National Day (September 2). The event, organised by the Vietnam Union of Friendship Organisations (VUFO) and the Malaysian Embassy in Vietnam, consisted of 13 traditional singing and dancing performances of Vietnam and Malaysia’s Pahang state. Speaking at the event, VUFO Secretary General and Vice President Don Tuan Phong said the Malaysian art troupe’s visit will help strengthen friendship between Vietnam and Malaysia’s people, thus contributing to relations between the two countries. Vietnam-Malaysia ties have developed tremendously, said Phong, adding that Malaysia is Vietnam’s seventh biggest trading partner and investor with two-way trade of 8.4 billion USD in 2016 and total investment of 12 billion USD in the first five months of 2017. The two countries have also boosted relations in culture, sports and tourism, labour cooperation and high-level delegation exchanges, Phong noted. He expressed his belief that cooperation between the two countries will further develop for peace, stability and development in Southeast Asia and the world. For his part, Malaysian Ambassador to Vietnam Mohd Zamruni Bin Khalid emphasised the friendship of Vietnam and Malaysia, saying that the establishment of their strategic partnership in 2015 was a success in bilateral cooperation enhancement.